Photograph taken in Wuchang of a large group of British and Chinese men which includes the Viceroy and Governor, 30 July 1902. The photograph is annotated, 'Viceroy and Governor second row [from the back in the middle of the row sitting next to each other] sitting with Consular Body on right and left'. Between 23 and 24 June 2017, Queen’s University in Belfast (Northern Ireland) planned an academic conference gathering international scholars from various disciplines ranging from history, art history, history of photography, to sinology. Entitled New Lenses on China: Photography in Modern Chinese History and Historiography, this conference's successive papers reflected on the impact of photographic sources on our understanding of Chinese history, while assessing the state of the field and considering its future trajectories. On this occasion, Queen’s University Special Collection also displayed a selection of photographs of late imperial China from the Sir Robert Hart (1835-1911) Collection outside the auditorium where the conference took place. This collection includes several thousand photographs, mostly of China around 1900, along with portraits of Hart and his friends, acquaintances and colleagues. 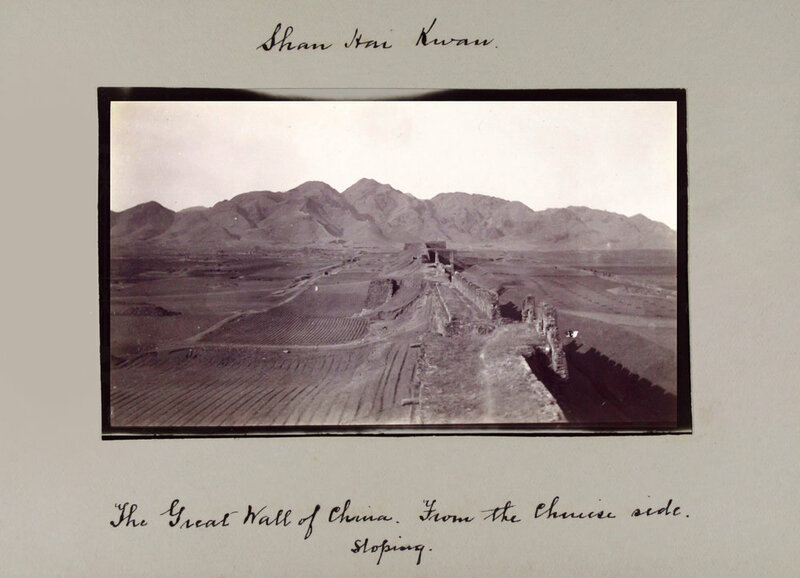 This photograph is part of an album that contains fifty images of Northern China. The photographs capture many elements of Chinese life and they are all annotated. This talk explored the tensions and methodological (and other) problems he has faced as a historian of the socio-cultural world or migration utilizing private family collections of historic photographs of China. This talk explored the friendship, collaboration and commonalities of approach in the photographic output of these two Scottish photographers, helping to create a more rounded picture of the contributions of both men. Christian Henriot, Aix-Marseille Université: Seeing through death in modern Shanghai: A visual encounter"
This paper questioned the representation of death in modern Shanghai in the form of a visual narrative. Starting from the dead body, this narrative initiated a journey into the singular and most often fates of the body in post-mortem among Chinese and foreign residents in Shanghai. This paper focused on a collection of photography by Albert Pichon, an official in the Chinese Maritime Customs Service, who documented the trade route between Bhamo and Tengyue (Tengchong) in 1908. This paper explored how one can interpret such images, including through reference to museological writings on how colonial photographs may be interrogated. It also examined the extent to which they can relied upon as documents of Hong Kong’s colonial past. This paper treated photography as a social phenomenon. In particular, it looked at some of the evidence that demonstrated the rise of a photography culture whose ubiquitous commercial headquarters were the photography studios dotting city districts and appearing usually singly along village street. Based on the Old Photos materials, this paper looked at how ordinary people coped with the extraordinary changes brought by revolutions and wars in their lives and their interactions with great political affairs in the nation. The construction of gardens around Guangzhou (Canton) reached a peak from the end of the 18th century to the beginning of the 20th century. In this paper, she combined various written and textual sources including photography to reconstitute two of the most significant gardens of the 19th century Guangzhou. This paper showed the value of using street photographs to engage with neglected forms of advertising within the city. It explored various digital tools that opened new possibilities for using photos as historical sources or materials for writing visual narratives. This paper explored how a group of photographers in wartime China became journalist photographers upon the establishment of New China. Their careers (1930s to 1970s) shared intangible energy in the making of revolution and among the viewers onsite. This paper examined how photographic affected was explored, defined and promoted in the Social world by focusing on “We Love Peace” (1952), a seemingly mundane photograph featuring a boy and a girl cuddling with peace doves that became an iconic image of China’s intervention in the Korean War. In the Sir Robert Hart’s collection at Queen’s University Belfast there are two albums of pictures of Tianjin taken at the turn of the 20th century. The presentation aimed to tell the story that the photos were narrating and consider what was the real purpose of the photos at the time it was taken. This paper asked how we do history in the age of photography, while reflecting upon the uneasy disciplinary relationship with photographs and historical sources. This paper started by discussing the history of missionary photography and by providing an idea of the state of missionary archives today. This paper explored an interesting example of global travels through photography from a Shanghai perspective in the form of an 1886 magic lantern lecture given by the pastor and educator Yan Yongjing (1838-1898) at Shanghai’s Polytechnic Institution. This paper examined the impact of photographs produced during campaigns of exploration in China on our understanding of Chinese cultural heritage. [Chine. Province du Gansu], vue de Touen-Houang [Dunhuang, vue de la vallée, prise de la grotte 16] [China. Province of Gansu, view of Dunhuang, view of the valley taken from the grotto 16]. 1908. Digital photograph after a gelatin silver negative on celluloid roll film, 18 x 24 cm (AP8204; Old number 3) © MNAAG.